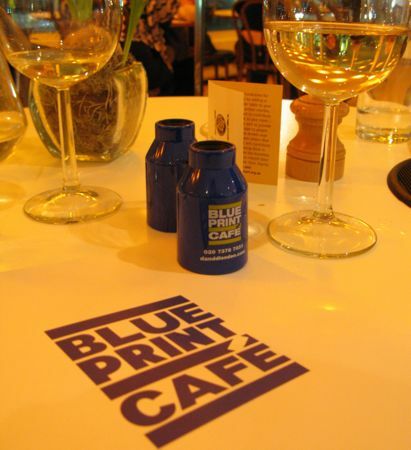 With its prime riverside location on the first floor of the Design Museum, the Blueprint Cafe is for me one of the City’s nicest dining spaces. With views of Tower Bridge and the City of London to the West and the Docklands and Canary Wharf to the East, it’s like eating on a cloud above the Thames. Its dramatic floor-to-ceiling windows spanning the full length of the Museum’s West Wing give this place one heck of a panorama. And don’t worry about having to squint at the boats passing by… Every table even has its own pair of retro blue Binoculars so you won’t miss a thing. Head-Chef Jeremy Lee’s food is generous, hearty and seasonal with a short, but constantly changing selection of British and Modern European dishes. 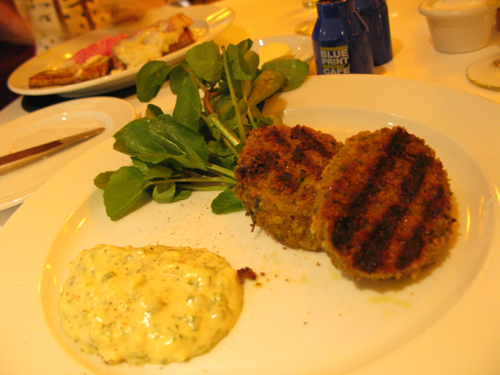 His original but at times quirky combinations on the menu never cease to intrigue. 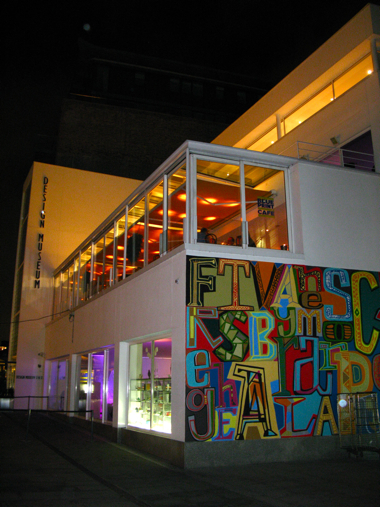 However, I can’t say that I’ve always been bowled over by the end-products of his eclectic style. Some of the dishes really are are a stroke of genius. While others… well I’m frankly just not sure about. 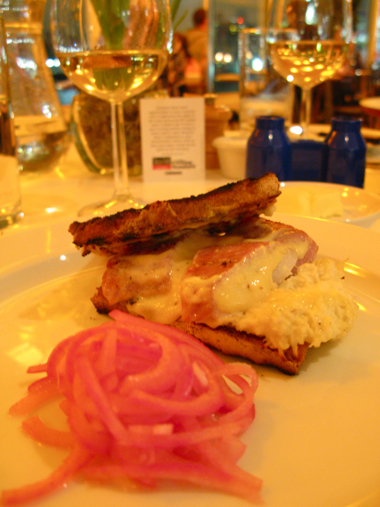 One dish that is sure to leave a lasting impression is the Warm Smoked Eel Sandwich. Who would have thought Eel could work so well when paired with pickled sweet red onion and freshly grated horse-radish cream. The individual flavours are extremely bold and punchy, but when the thick slabs of melt-in-your-mouth Eel fillets are eaten together with the other elements and just-toasted Sour-dough, its a delectable dish that spans spicy, sweet, savoury and rich, screaming OhYes with each passing bite. Crunchy Pig’s Trotters (a.k.a “Crubeens), an Irish speciality, was much less impressive. Slightly soggy and not quite warm enough, it was served up with a blob of Aiolo and Watercress – neither of which complemented it very well. A rather fancy name for an otherwise very ordinary Pork Nugget and definitely one of those dishes which sounded a lot more interesting when described to us by the waiting staff than in reality when put in front of us. Onto the mains. 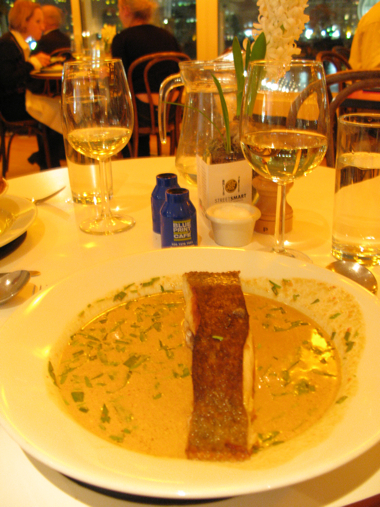 Jo went for one of the fish courses: Pan-fried Brill in a creamy, Tarragon based sauce. The dish wasn’t exactly a looker – a long, clumsy looking Brill fillet swimming in a mess of ochre-coloured sauce. For what its worth, the fish was cooked well, with a beautiful crisp on the skin. However, I’m just not a fan of this white flat-fish. On the couple occasions that I’ve had it in the past, it’s always been a bit bland in the taste stakes. Nothing new here. Not even the rich, slightly over-powering Tarragon sauce could rescue it. Give me Halibut or Dover Sole over Brill any day. No problems with the super-size me Rabbit pie. Served piping hot, straight out of the oven, it was hearty, comfort food at its very best. The puff pastry was crispy and buttery. 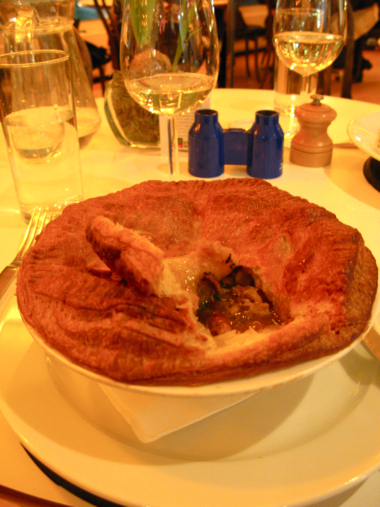 The pie filling, rich and gamey with wonderful depth of flavour from the rabbit and ale-based gravy. A lovely dish. At under 20 pounds a head including wine, its all, surprisingly inexpensive. Yes, the food is a bit hit-and-miss, but when the views are this good, all is forgiven.